Climate change threatens our living planet. Less-developed nations face the greatest risk from rising seas and parched land. By empowering women and smashing all barriers that prevent women from achieving full reproductive autonomy, John Seager argues that we can uphold inalienable individual rights while fostering a better, safer, less-crowded world. His organization, Population Connection, believes this is the single best way to prevent climate chaos. “Population control” is never the answer. Instead, his presentation will show that unfettered access to health care and abolishment of Trump’s Global Gag Rule are necessary parts of a sustainable future. John Seager advises the #Fight4HER National Campaign. 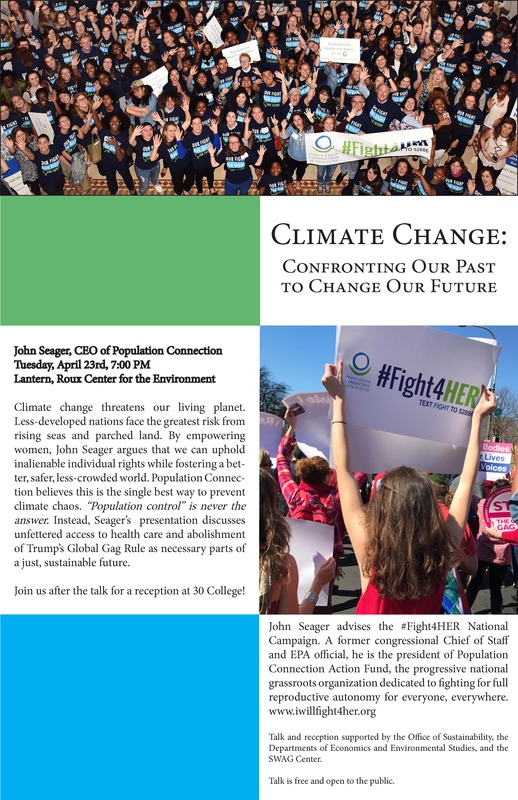 A former congressional Chief of Staff and EPA official, he is the president of Population Connection Action Fund, the progressive national grassroots organization dedicated to fighting for full reproductive autonomy for every woman everywhere. Reception for the Bowdoin Community will follow at 30 College. This event is open to the public free of charge, and is co-sponsored by the Economics Department, Environmental Studies Program, the Sexuality, Women and Gender Center (SWAG), and the Sustainability Office. The Maine Environmental Education Association is hosting is annual statewide conference “Strengthening Maine Communities Through Environmental Education” at the University of Maine’s Hutchinson Center, in Belfast, Maine on March 14-15, 2019. The research symposium is March 14th and is cohosted with the Maine Math and Science Alliance. The full Conference is March 15th, is cohosted with Unity College. The conference will bring together 150+ leaders, educators, and students from throughout Maine and New England to share innovative environmental education strategies, and strengthen teaching, public communication, and leadership skills – all in serving to enhance the relationships among Maine’s people, communities and environment. Conference participants will have the opportunity to choose from over 25 workshops, participate in a nature-based makers space, environmental education resource share, learn about preliminary results from the statewide Census for Community-based Environmental Learning, explore exhibits, network and students can gain support on job and internship applications. Teachers can earn contact hours for attending this conference and scholarships are available. To learn more about the conference and to register visit www.meeassociation.org. Please let your students know about this opportunity. There are scholarships available, so if cost is a barrier for your students, please have them reach out. Thank you! Phil’s Farm is a 1 acre, no-till farm that produces organic vegetables, herbs and flowers in Eliot, ME. The farm was started by Phil Cuddeback, class of Bowdoin 2013, in the spring of 2018. The food is sold primarily to a 50 member CSA with a pickup location at a brewery in Portsmouth, NH. The CSA allows Phil and his farm crew the opportunity to engage with their customers and in turn helps the customers gain a better appreciation for the food they’re eating. Other markets include a farmers market in York and a couple restaurants. Phil’s Farm believes in producing affordable food in a way that is good for the environment, the people producing it and the end consumers. As a result, we do not use any pesticides, herbicides or harmful chemicals on the farm. We also strive to minimize the use of gasoline, oil and plastic products and instead use solar power, hand tools and reusable bags or no packaging at all whenever possible. To learn more, check out www.philsfarmcsa.com and @philsfarm_inmaine on Instagram. Hours, Dates & Schedule: The internship will take place from June 3rd to August 30th. The expected hours on the farm are Monday through Friday 6am to 4pm with a quick break for breakfast and an hour for lunch. Attending the CSA pickup on Thursdays from 5-8pm is optional but can be a fun way to interact with the customers. The crew this year will be myself and one MOFGA (Maine Organic Farmers and Gardeners) apprentice. The apprentice will likely be someone who is learning to farm but will be with me from April to October. Greenhouse planting, watering and potting up – We fill trays with potting mix, plant the seeds, cover with more potting mix and water them in. Each day, all the trays get watered. Certain plants like tomatoes, peppers and cucumbers get moved from trays to larger pots to give them more space before being transplanted outside. Bed preparation – this involves raking leaves off the bed, broadforking to loosen the soil, applying compost and amendments and raking the bed again to create a level surface. Transplanting – the act of taking seedlings from the greenhouse and planting them in the field. Harvesting – we use a knife to cut greens or simply our hands to harvest larger products like tomatoes and cucumbers. Washing and packing – we use both a series of dunk tanks and a spray hose to clean the vegetables. They then get weighed and packed into bins or bags. Pest and disease management – this can involve physically removing pests like the cabbage worm or protecting drops with a thin fabric sheet called row cover. Disease management can involve pruning and removing infected plants. Almost all of the tasks will be done together as a team. This allows me to best teach the tasks as well as to work efficiently while having fun. A successful candidate should feel comfortable and enjoy working with their body. You should also be comfortable working on tasks for a couple hours at a time – sometimes we’ll listen to music, have a conversation or just enjoy the silence in almost a meditative state. You should also enjoy working outside and be willing to work in all kinds of weather conditions. I would like you to have the understanding and to keep in mind that I am running a business and that this is my second year doing so. This can sometimes be stressful and I may ask that we try to do things faster or skip certain steps in order to get certain tasks finished in a given amount of time. Farming is all about timing and process. Application requirements: Resume and a brief cover letter. Housing is not included but I can help you find suitable housing through craigslist and my network of friends in the area. This is an unpaid internship. If you are a college student, please reach out to your school to see if summer internship funding is available. For non-college students, there may be educational grants and funding available for unpaid internships. I’m happy to help you find such funding to the best of my ability. As with all jobs of a farm, you are welcome to take home as much food from the farm as you would like. Please send you resume and brief cover letter to me at philcuddeback@gmail.com. The Island Institute works alongside Maine’s island and coastal leaders to catalyze community sustainability in the state’s 120 island and coastal communities and share what works among these diverse communities and beyond. Strengethening Community Economies through small business training and support, aquaculture business development, high-speed broadband access and digital literacy, access to affordable renewable energy, and helping island and coastal communities prepare for impacts from climate changes and sea level rise. Are you graduating this year and looking to further your marine science skills? Are you looking for an exciting opportunity to study marine biodiversity in South Africa this summer? Cape RADD facilitates a 4 week field course for individuals or groups who want to learn more about the marine environment, conservation and research through hands on field experience and diver development. The Cape RADD course includes training in multiple data collection and field operation techniques, theoretical workshops on analysis techniques and tools like R, GIS, and Coral Point Count. Come spend a month abroad, scuba diving and freediving in one of the most beautiful parts of the world. As a Cape RADD student you will enroll in a fascinating and rewarding program that will put you under the water for a hands on experience and valuable contribution to the marine research projects taking place just outside Cape Town. Check us out on Facebook or Instagram to follow our story and see what our students are up to! This program is ideal for students, graduates, divers, conservationists or just those with an interest in marine biology looking to gain extra knowledge and field experience in the marine sciences, to develop new skills and show some real life experience on their CV. Visit http://www.caperadd.com or email info@caperadd.com for more details. When: Monday, January 14th, 2019 from 6:30 pm to 7:30 pm. Where: Freeport Community Services, 53 Depot Street. Mr. Roche will talk about the new changes that are coming to Ecomaine’s recycling program in 2019. He will also answer your questions about the “What’s What” of Recycling. CACS crafts unique Alaska Coastal Ecology educational programs for middle school, high school, and college student groups from around the state, country, and even world. 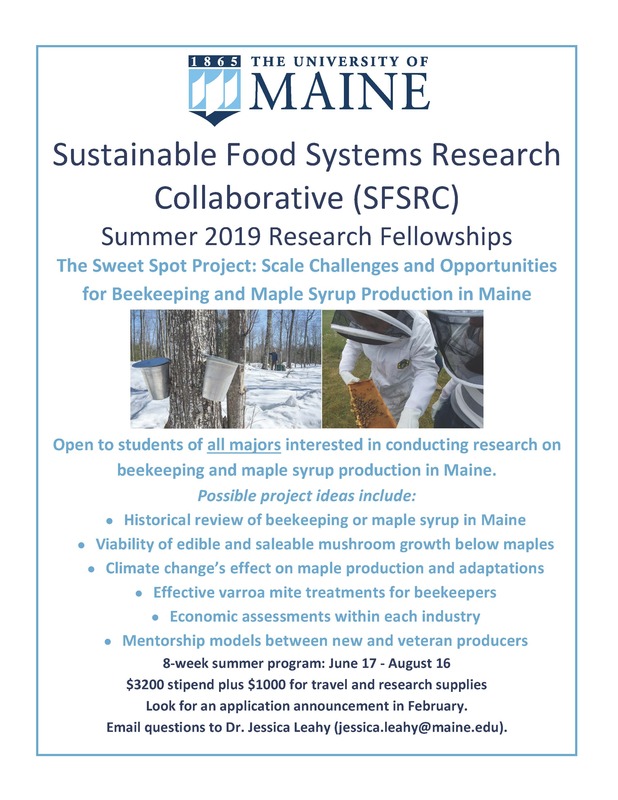 If you are interested in bringing a group of students to our remote Peterson Bay Field Station in spring, summer, or fall, please get in touch. 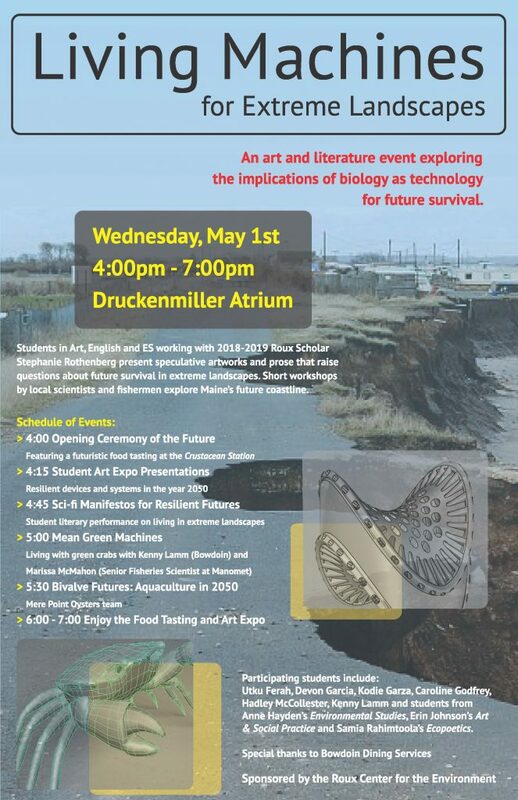 Using evidence-based teaching methods and immersing students in the amazingly diverse and complex human-ecological systems of the Kachemak Bay region, these field study trips can be just a couple days long as part of a longer trip throughout Alaska, or you can focus your time in Kachemak Bay, spending over a week at the Field Station. Check out https://www.akcoastalstudies.org/education-programs/summer-youth-programs/for-groups.html or this brochure for more information. Each fall, the Kachemak Bay Campus of Kenai Peninsula College, University of Alaska Anchorage, located in Homer, Alaska, offers students from around the country the opportunity for an academic hands-on learning experience studying biological sciences with easy access to cold-water marine habitats and an Alaskan theme. The semester has been designed to meet the needs of students majoring in the natural sciences in a creative and adventurous way. For ages 12-15, this 10 day outdoor adventure and environmental stewardship camp explores the changing environment and how this connects to a most basic and delicious part of our lives – food! Activities include backcountry & yurt camping, hiking along forests, beaches, alpine, and at the foot of a glacier, berry picking and preserving, learning about salmon fishing, tidepooling, understanding ethnobotany and local edible plant uses, and having fun in the kitchen making a range of homemade foods. Throughout all this, participants learn about how different changes to the forest, beach, and marine ecosystems affect the food we eat and how our food choices affect the environment and communities around us. Contact katieg@akcoastalstudies.org or 907-235-1974 for more details.